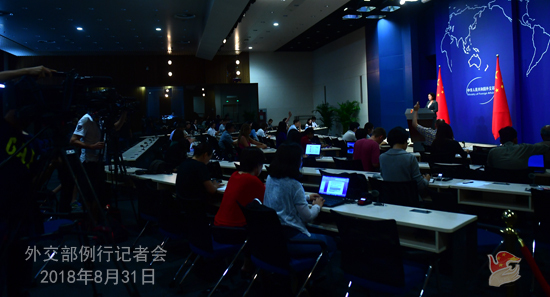 Q: We noted that the CNN website published a report entitled "Employed by China"on August 30, telling how the investment of Chinese enterprises in Africa has improved the local infrastructure and created enormous job opportunities for the local people. What's your comment? A: We have noted the relevant report and welcome the objective, unbiased and balanced coverage of China-Africa cooperation by such international media as CNN. It is noted that this article mentioned that a McKinsey report last year, which surveyed more than 1,000 Chinese companies in eight African countries, found that on average 89% of their employees were African. Several million African jobs have been created by China on the continent. Nearly two-thirds of Chinese companies have provided skills training, while half offered apprenticeships, and a third had introduced a new technology for the local community. In fact, Ethiopia has become one of the biggest beneficiaries of China's foreign training programs. Since this year China has offered short-term training opportunities to over 1,200 Ethiopian officials, scholars and technicians, and 200 Ethiopians are expected to receive scholarships under the Chinese government's program to provide diploma and degree for them. The mainstream media in Ethiopia have commended the contributions China's training programs made to that country. At the 2018 Reunion of China Graduated Ethiopians, Ethiopia Prime Minister Abiy Ahmed commended that China has made outstanding contributions to the human resources cooperation between the two countries. The United Nations Development Program, the World Food Program and the United Nations International Children's Emergency Fund have all expressed their admiration for China's contributions to Ethiopia's human resources development and their readiness to cooperate with China in providing human resources training to Ethiopia. All these China-Ethiopia cooperation outcomes and highlights are just a tiny drop of water in the vast ocean of China-Africa cooperation, and there are far more such impressive cases. For example, the Chinese-built Mombasa-Nairobi Railway has raised Kenya's economic growth by 1.5 percentage points. China has also trained over 5000 professional technicians and created 46,000 jobs for Kenya. The completion of the railway cuts the costs of transportation for goods by almost 80%, boosting the development and prosperity of regions along the railway. The Beijing Summit of the Forum on China-Africa Cooperation (FOCAC) is just days away. We hope and believe that the Beijing Summit will achieve a full success and fruitful outcomes, enabling Chinese and African people to get the benefits the close China-Africa cooperation delivers to them. Q: UN experts reportedly criticized China's policy in Xinjiang yesterday. What's your response? A: I suppose you are talking about the relevant meeting of the UN Committee on the Elimination of Racial Discrimination (CERD). Recently, the Chinese delegation expounded on China's new progress in eliminating racial discrimination and protecting the rights and interests of ethnic groups to the CERD in Geneva. The conclusion from the review by the CERD appraised what China has done and achieved in fulfilling its commitment, and spoken in praise of China's legislative, policy and administrative measures in protecting the rights and interests of ethnic groups. As to the Xinjiang-related negative remarks in the review as you mentioned, they are based on unverified and irresponsible "information" that has no factual basis at all. People of all ethnic groups in Xinjiang aspire for social stability and lasting peace. Those series of measures in Xinjiang are aimed to promote stability, development, unity and ensure better livelihood. They are also carried out in order to combat ethnic separatism and violent and terrorist criminal activities in accordance with the law, safeguard national security and protect people's life and property. The sense of security and the fulfillment for social stability of people in Xinjiang has been greatly enhanced. As for all the preventive counter-terrorist measures we've taken, many countries around the world do the same. Q: Russian Foreign Minister Sergey Lavrov said on August 29 that Syrian rebels are planning to stage a chemical attack in Idlib. He said that the forthcoming staging of this attack aims to blame the Syrian government and to provoke western countries to interfere in the anti-terrorism operation of the Syrian government forces in Idlib. What is your comment? A: We have noted these reports from the Russian side that Syria's Idlib province may see a chemical attack. Our position is very clear. China opposes the use of chemical weapons by any country, organization, individual under any circumstance and for any purpose. The Syrian issue has come to an important stage. All parties should work together for greater synergy, move forward the political settlement of the Syrian issue at an early date, and continue to join efforts to combat terrorism. Q: The Director General of the IAEA submitted the latest quarterly report on August 30. It once again confirmed that Iran continues to fulfill its nuclear-related obligations under the JCPOA. What is your comment? A: We have noted this report submitted by the Director General of the IAEA. It marks the 12th time in a row that the IAEA confirmed Iran's compliance with its nuclear-related commitments under the JCPOA. We welcome and commend these efforts made by Iran and the IAEA. 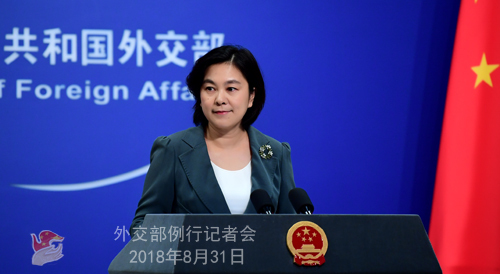 For the common interests of the international community, China hopes that all relevant parties could bear in mind the larger and long-term picture and continue to safeguard and implement the JCPOA. Q: We noted that the Washington Post and some other Western media have recently talked about the so-called "China debt trap" in their reports. In the meanwhile, we also noted that Philippine Foreign Affairs Secretary Alan Peter Cayetano told reporters at a Senate Finance Commission hearing that the Philippines will not fall into a debt trap because only one percent of its debt is to China. What's your comment? A: We really appreciate that Foreign Secretary Cayetano was telling a big truth to the media. Indeed, the loans China provides to relevant countries only account for a small portion of their foreign debts. I wonder how could the Western media come up with the so-called "China debt trap"? Take the above-mentioned report by the Washington Post as an example, which mentioned Sri Lanka and Pakistan. In fact, according to statistics from Sri Lanka's central bank, Chinese loans only accounted for around 10% of its foreign debts in 2017, of which 61.5% is preferential loans at interest rates below that of the international market. Sri Lanka's main debt burden is not caused by China's loans. Sri Lankan officials said early on that there is no such a thing as "debt trap" for Hambantota Harbour. According to the Pakistani government's statistics, 42% of Pakistan's debts are loans from multilateral institutions, and Chinese loans merely account for 10%. China provides preferential loans to Pakistan at a rate of around 2%, far below the rate offered by Western countries. I think these figures really speak volume. Some media also talked about the debts of African countries. As is known to all, there are complex historical backgrounds and realities for this issue. In essence, the African debt issue is by no means merely an economic and financial issue, but the result of unfair and unreasonable international economic order. A figure I saw may be of interest to you: from 2000 to 2016, China's loans only accounted for 1.8% of Africa's foreign debts, and most of them are offered to infrastructure. None of the African countries has once complained about being trapped in debt crisis because of their cooperation with China. On the contrary, many leaders of African countries have appraised China's investment and financing cooperation with them and are looking forward to greater cooperation with China in this respect. Like what I said when taking the question concerning the "debt trap" of Pacific Island countries yesterday, why the money is sweet "money pie" when it is offered by the Western countries but a dark "money trap" when offered by China? This is utterly illogical. We hope certain Western countries, people and media will put China's cooperation with relevant countries in perspective . Q: A Philippine navy vessel ran aground near Banyue Jiao in the South China Sea on the night of August 29. Retrieval operations are already underway by the Philippine side. Do you have more details on that? A: China has learned of the relevant situation. China Coast Guard vessels are already at the scene. "Nanhaijiu 115", specialized in maritime search and rescue, is also in nearby waters. China is discussing with the Philippines on the relevant search and rescue matters. Q: The 25th Joint Working Group Meeting on the Implementation of the DOC will soon be held. Could you offer more details? A: After consultation, China and ASEAN countries agreed to hold the 25th Joint Working Group Meeting on the Implementation of the DOC in Siem Reap, Cambodia on September 1 and 2. All attendees will exchange views on the implementation of the DOC, maritime practical cooperation and the COC consultations. Thanks to the concerted efforts of China and ASEAN countries, the situation in the South China Sea is improving. A single-draft negotiating text of the COC has been arrived at and consultations are being moved ahead steadily. During this meeting, China will continue to work with the ASEAN countries to keep the momentum of dialogue and cooperation, actively engage in consultations on the COC text, advance maritime practical cooperation, and strive for greater outcomes and progress. Q: It is reported that the US is considering tariffs on $200 billion worth of Chinese imports. What is your comment? 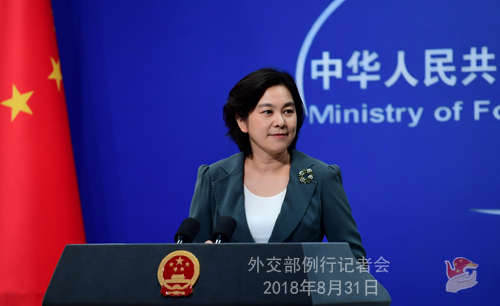 A: At yesterday's press conference of the Commerce Ministry, its Spokesperson Gao Feng already talked a lot about the trade issue between China and the US. Playing hardball or pressurizing will not work on China, nor help solve the problem. For those who still think that China will bend to their intimidation, threat and unwarranted accusation, it is time for them to wake up. Meanwhile, China's attitude and position on trade frictions remain consistent. We are committed to settling the relevant issue through equal-footed, reciprocal, sincere and practical dialogues on the basis of mutual respect. I believe that this serves the fundamental interests of the relevant parties and meets the common interests of the international community. Q: We have seen a report that says that Swaziland is trying to establish diplomatic ties with China. Can we have your comment on that? A: I would like to reiterate that on the basis of the Five Principles of Peaceful Co-existence and the one-China principle, the Chinese government stands ready to develop friendly relations with all other countries. We hope that the relevant country could take the right step in accordance with the trend of the times and its own interests and join the big family of China-Africa cooperation at an early date.